Apparently our 89-year old house has never had a mailbox. We are used to having one, and got tired of having our magazines and such folded and crammed through the mail slot in the aluminum storm door. Trying to keep with our arts and crafts theme, with Celtic accents, we went with a handmade (but not obscenely expensive) one at Gaelsong.com. Two days and no one has swiped it, great. 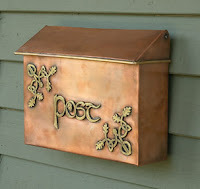 We do read about people stealing copper downspouts nearby, so I don't think we are worrying needlessly. It's nice and solid and works great, though it is a bit rough in a handmade (in Turkey) sort of way. case we can polish it and spray it with something later.